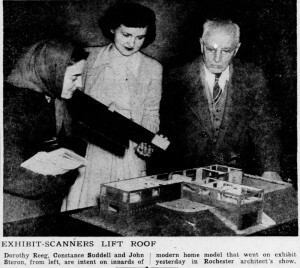 This is a model of 175 Huntington Hills South being shown at the Rochester Society of Architects annual exhibit on February 12, 1948. The middle woman holds the roof in her hands. When you click on the photo for the enlargement, you can easily see the wraparound windows throughout the house. Two stairways on either side of the garage take you to the two entryways, each with an adjoining outdoor patio. And it is surrounded by 3 acres of flowers, gardens, a pond and trees. Our neighbors have been enjoying this fantastic home for thirty or forty years.